The first time I arrive to Coco Espresso on Yorkville, a lazy Tuesday afternoon, I am greeted by a tall, lean figure that bestows upon me a heartfelt and genuine “Ciao Bello!”. I mumble back a shy, inaudible “Hello”. I am here to meet one of the owners of Coco and spend some time with him at their coffee house (bar). As we snake our way to the downstairs entrance and into his shop, Raffaele keeps shouting greetings to patrons and instructions to staff at a dizzying pace reminiscent of an orchestral conductor readying his pupils for a crescendo. I quickly learn that I will hear the greeting of “Ciao Bella” many more times that day and that each subsequent one will be as personable and genuine as the last. Having visited Italy many times, I shouldn’t be surprised at the warm welcome, instant charm and palpable energy that greets me and percolates through the warm decor of Coco Espresso. I am nonetheless intrigued. Amidst Raffaele’s abundance of warm energy and soft Italian tunes playing in the background, I keep reminding myself that I am in Toronto and not in Italy. As I will soon find out, this is by design and a true representation of a man who transported his vision and inspiration from the quaintness of Sicily to the hustle and bustle of Toronto. Raffaele Bettallico grew up in Southern Italy in the picturesque city famous for its espresso and pizza. It is in the city of Naples that began the story of a man whose coffee we adore, and whose charisma we crave. Fifteen years ago, Raffaele needed a change of scenery and set out on a trip to America. He wanted to explore the world, but also, he craved a blank canvas, one on which he will paint his vision. This vision was a place to start a new family, a place to be accepted as an Italian, a place where who you are and where you are from is celebrated. The moment he stepped foot in Toronto, he knew it was meant to be. I wondered several times why Raffaele doesn’t boast more routinely about the quality and taste of his coffee, which by the way is fantastic! As Raffaele simply explains it, drinking coffee is not a means to an end, but an experience unto itself. It is quite evident that great tasting and quality coffee is a default setting in his mind, but that tasting Italy is more than just great coffee or the manner you drink it, it is the fulsome experience associated with socializing at the coffee bar. Simply put, the socializing associated with the experience is equally as important as the taste that touches your lips. In Italy, drinking coffee and socializing, discussing politics or sports goes hand in hand and must happen together. It is this complete experience that Raffaele and his partner Carmen brought from Italy. I ask Raffaele candidly what he brought to the Coffee scene in Toronto and what his challenges were. After tackling several anecdotes of his passions and why he chose the coffee business—I chuckle to myself thinking that Italians can speak at length about any topic—he refocuses to explain to me that initial vision of Coco. 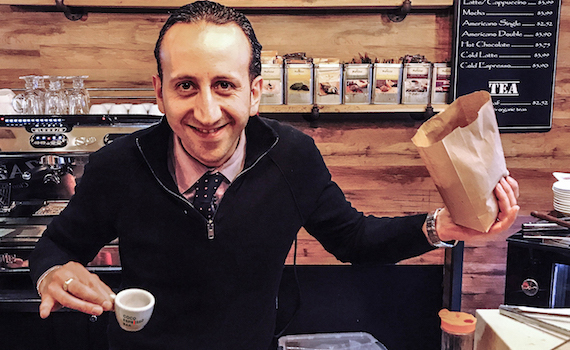 Coming from generations of family members involved with coffee, Raffaele saw an opportunity and desire to impart this knowledge and taste to Torontonians. “I wanted to bring an authentic Italian touch to Toronto and at first, simply educate people how to properly drink coffee.” Merely fifteen years ago, there was not a strong authentic coffee scene in Toronto. His challenge was not just the vagaries of opening a new business but imparting a deep knowledge of coffee and how to drink it on unassuming locals. He explains that in a place with many cultures such as Toronto, though people may be unknowledgeable at first, they are eager to try different ways of doing things and that he just had to turn this eagerness into a teaching moment with regards to proper coffee etiquette. Toronto has become such a multicultural and immigrant city that we’ve become immune to the novelty of it all. Hearing Raffaele recount it makes me long for my own experience again. I feel joy as he expresses in vivid detail how he could start a new life in Toronto, be accepted for who he is and share with everyone elements of his own culture and coffee expertise here. Make sure to subscribe to our newsletter to keep up with our latest news and promotions! Every so often on a Saturday night my husband and I love to go and have amazing ice cream and great espresso. Cocoe espresso bar makes you feel a little piece of Italy. Coco Espresso Bar All Rights Reserved.